Up from the Bargello, this is one of the largest and most ornate palazzi in the city. Built by Michelozzo for the Salviati family in the 15th century, it was remodelled in the 17th century; in 1709 a splendid new ballroom was added in honour of Salviati's house guest, the King of Denmark. At the end of the 18th century, when the last Salviati, Anna Maria, married the Roman Prince Marcantonio IV Borghese, the palace passed into the Borghese hands. Note the Borghese dragons balancing precariously on the cornice. In 1803, their son Camillo Borghese, one of the wealthiest men of his day, married the widowed Pauline Bonaparte and was responsible for shipping so many of Italy’s artistic treasures off to the Louvre at her brother’s behest. Pauline, already renowned for her love affairs, had one with the famous violinst Paganini. After Napoleon's fall they separated, and while Pauline and her mother lived in Rome under the protection of the pope, Camillo moved with his mistress to Florence. He had forty rooms of the redone in the grandest possible Neoclassical style for a fabulous party in honour of the wedding of Habsburg Grand Duke Ferdinand III and Princess Maria Ferdinanda of Saxony in May 1822. In 1839, after Camillo's death, the Palazzo was sold to Luigi Cappelli, who rented out part of it as an elite club, the Casinò Borghese, that still exists. 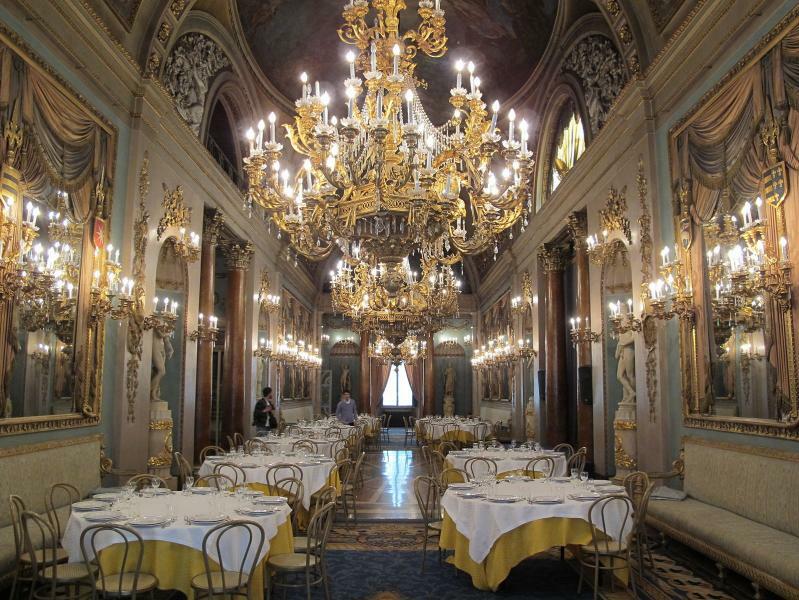 Descendants of Cappelli and current owners, the Tognini Bonelli family, still live here, and in 1994 restored the glittering monumental rooms which they let out for special events, dinners and other occasions.